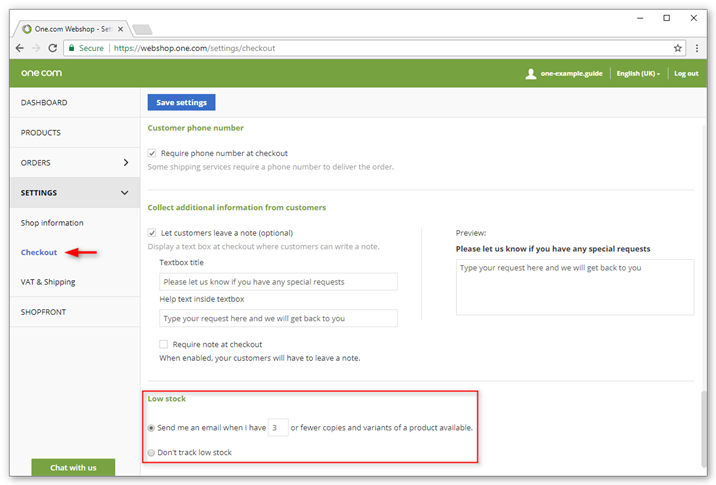 You can select to receive an email notification when you have low stock on one or more of your products. Login to your One.com Control Panel and click Online Shop. Click Settings and then Checkout. Scroll all the way down to Low stock. Select the first option, if you want to be informed and set an amount for when you want to be notified. If you don't want to receive any notifications select Don't track low stock. Another way of keeping track of your stock is by adding a Stock Keeping Unit (SKU) to each product. Check out our FAQ to find out more.